In tech years, Surface has been around forever, but in actual Earth years, it’s been less than five years since Microsoft first put their toes into the PC hardware pool. The Surface lineup has always been about offering something unique on the computing landscape, with the Surface RT offering the first kickstand on a notebook, and the Surface Book offered a detachable GPU base. The quality of the products has improved very quickly over the last five years too, and with the Surface Studio, Microsoft is now offering one the best displays available to anyone in any device, and Surface Pro 4 is easily one of the best devices in its category (which it created). But today they’ve taken a different turn. Today Microsoft is announcing the Surface Laptop. There’s no kickstand, no detachable display, no ability to fold it into a drafting table. There’s no fancy trick at all with the Surface Laptop. Microsoft just decided to finally build the one product that people were hoping they would build, and if it’s executed like most of their products, it should be a pretty strong offering compared to the competition. Although we were unable to attend the launch event in NYC today, let’s dig into what we do know about this to see how close they’ve come to the mark. With most of their products, they have tried to introduce a new category of computing, but with the Surface Laptop, there is an already large group of Ultrabooks to compete against. "Up to 14.5 hours video playback"
Starting with the display seems to be a great jump-off point, since Microsoft, more than any other OEM, has been pushing displays as a focal point, and it is again in the Surface Laptop. It features a 13.5-inch PixelSense display, in the now common aspect ratio for Surface of 3:2. Microsoft touts its devices as productivity machines, and the 3:2 aspect ratio helps a lot there. For those with good memories, the Surface Laptop’s display is the same size as the Surface Book, but it is not the same display. The display density is lower than both the Surface Pro 4 and Surface Book, which both feature 267 pixels per inch. Likely in an effort to lower costs, and increase battery life, Microsoft has chosen a 2256 x 1504 resolution for the Surface Laptop, which works out to 3.4 million pixels, and 201 pixels per inch. As with all Surface devices, the display supports 10-point multitouch, and it can be used with a Surface Pen. Microsoft also claims 100% sRGB coverage, with individually calibrated displays. They lead the industry here, and are one of the only PC makers that offer calibrated displays across all their devices now, with perhaps the exception of Apple. Despite the lowered resolution, the excellent aspect ratio and color calibration should still make this a solid display for day to day use. Powering the Surface Laptop is an Intel Kaby Lake processor, with either the Core i5-7200U, or the Core i7-7660U. The Core i5 is along the same lines as what everyone is offering in an i5, but the Core i7 is a nice step up, featuring Intel’s Iris Plus Graphics 640. This is a handful of a name, this is the GT3e version of Intel’s latest integrated GPU, featuring twice the execution units of the normal HD 620, and it features 64 MB of eDRAM as well, so the overall processor should be faster for most tasks. It’s nice to see the Iris available, as it is in the Surface Pro 4 i7 as well. Memory starts at a mere 4 GB for the base model, but there will be 8 GB and 16 GB models as well. The Surface Laptop is leveraging LPDDR3 memory, so 16 GB will be the maximum. Storage is 128/256/512/1024 GB SSDs, as you’d expect in an Ultrabook. One of the more interesting aspects of the Surface Laptop is the keyboard and trackpad. The trackpad is the same trackpad as the Surface Book, which is probably the best trackpad in the PC space right now, so that’s a good thing, and the Surface Book keyboard is also excellent, so expectations for the Surface Laptop are that it will match the Surface Book in these regards, however Microsoft has chosen to outfit the Surface Laptop with an Alcantara keyboard deck. This is a synthetic fabric, and they’ve used it before in a special edition version of the Surface Pro keyboard, as well as the Surface Ergonomic keyboard. Although it’s fabric, it is coated in a anti-spill coating, so liquids should bead off of it if it does get wet. It does have a great feel to it, assuming it’s similar to the other Surface products, so this should be a nice addition. Like most Surface devices, it features a Windows Hello IR camera, allowing for facial recognition login, along with a 720p web cam. It would have been nice to see a 1080p camera here, but it should be adequate. The Surface Laptop also features a TPM 2.0 chip which should make it suitable for the enterprise. Microsoft is also showing off “OmniSonic” stereo speakers with Dolby Audio Premium, so in theory the sound quality should be ok, but with laptops the bar is always pretty low. The one real omission on the Surface Laptop is in expandability. 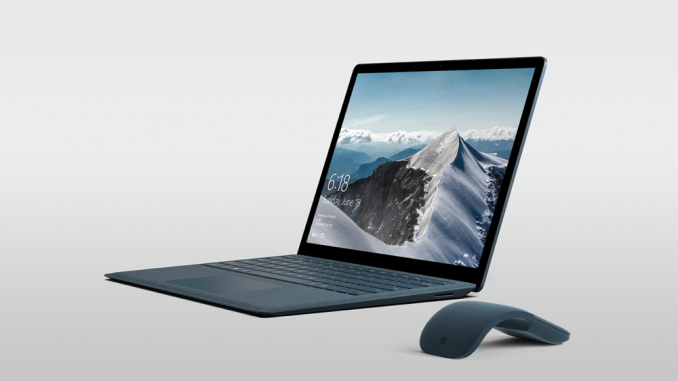 It features the SurfaceConnect port, for charging, just like the Surface Pro 4 and Surface Book, and Microsoft does sell a dock for this too. There is also a full-sized USB 3.0 port, and a mini DisplayPort. The one major omission is USB-C, which seems to be the port that Microsoft refuses to support. USB-C was around when they launched the Surface 3 back in April 2015, but they chose to charge it over micro USB, to its detriment. When they launched the Skylake powered Surface Pro 4 and Surface Book, USB-C and Thunderbolt 3 were available, but somewhat niche. In May 2017 though, USB-C should be on everything. The amazing thing is that they used the space for USB-C to offer a mini DisplayPort, when USB-C could do DisplayPort over its alternate modes. I have no problem with them keeping the SurfaceConnect port, but not offering USB-C at all, let alone Thunderbolt 3, seems like a missed opportunity. I agree the full sized USB 3.0 port is likely what most people would need right now, but a small bit of futureproofing with USB-C would not have killed them. So that’s the hardware out of the way. Microsoft has been using Surface devices to push their software since Surface was first announced with Windows 8, and that hasn’t changed with the Surface Laptop. It will feature a new Windows version called Windows 10 S. We’ll get into Windows 10 S in another piece, but the basics are that it’s a version of Windows 10 which will only work with apps in the Windows Store. Sound familiar? Of course it does, since Windows RT had the same restriction. The difference between then and now is significant though. When Windows RT launched, the Store was an empty wasteland, and Microsoft never got the developer buy-in that they had hoped for. With Windows 10, the major difference is that Microsoft offers a Desktop bridge, allowing companies to bring their Win32 apps to the store relatively unmodified. So despite not being able to run apps from outside the Windows Store, you will still have access to Microsoft Office, and apps like Adobe Photoshop Elements. In many ways, the Store versions of these apps are superior to the legacy implementations, with much easier install and uninstall, and a more robust security model. But for those that need to install apps from outside the Windows Store, Windows 10 S can be unlocked to Windows 10 Pro, and on the Surface Laptop, that unlock will be free for the first year. 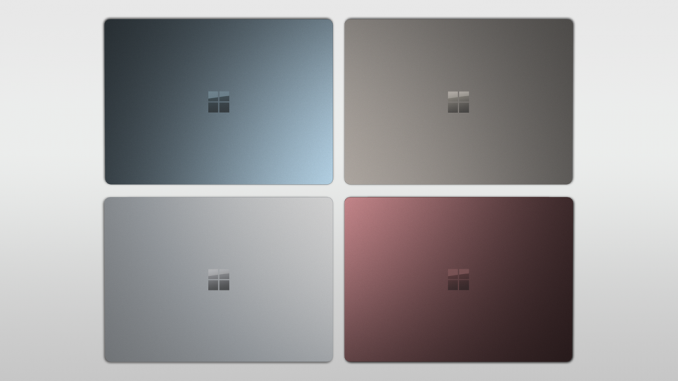 The new Surface Laptop is going to be available in four colors in the USA, with Platinum, Burgundy, Cobalt Blue, and Graphite Gold. Outside the USA, only one color will be offered initially, but the others should follow soon. And then there is the price. Microsoft is being fairly competitive with the pricing, with the Surface Laptop starting at $999 USD for the base 4 GB / 128 GB / i5 model. That’s a strong starting price for a premium Ultrabook, although the RAM limitations will make it unappealing to many. For $1299, the i5 model bumps up to 8 GB of RAM and a 256 GB SSD, which is more in the sweet spot. The i7 model with Intel’s Iris graphics starts at $1599 with the same 8 GB RAM and 256 GB SSD, and jumps to $2199 for the 16 GB / 512 GB model. Although the prices are high, the price comparisons to the competition are not that far off, meaning Microsoft likely didn’t make any friends with their OEMs today. 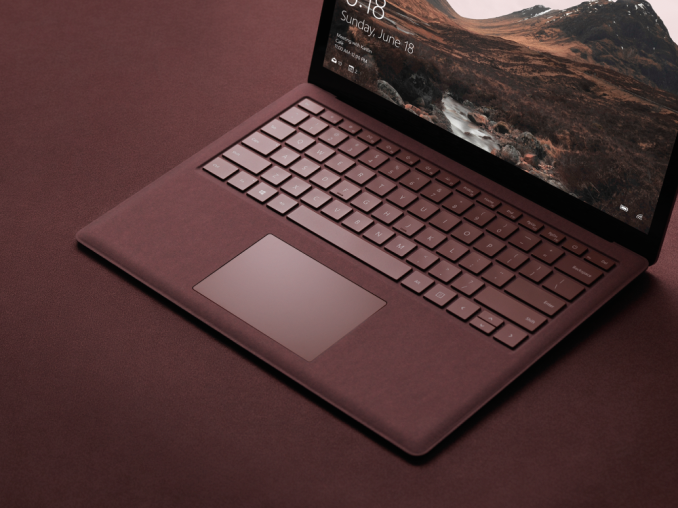 The new Surface Laptop is available for pre-order now, with shipments starting in June.